Posing these questions, Nelson uses images taken from the Renaissance era, while employing a retro-future imagery, leading viewers to explore the compression of time as well as the potent potential of technology. In “Lullabye Before the Storm,” Nelson combines images of a Renaissance woman cradling a robot child, with that of a ginger-colored cat staring out at the viewer, amazed. With a similar, pop-art star-shaped background, “New World” presents Renaissance woman and robot-child, a blue cat peering over her knee as she gently lifts the cover to her “child’s” head, letting out a plume of yellow smoke. “Raphaelbot” again juxtaposes a Renaissance image of Madonna and Child, here originally created by Raphael, with a robotic figure. In this work, the mother and babe are contained with the framework of a blue robot. A twin to this piece, “Leonardobot” places a Leonardo da Vinci Madonna figure nursing her child inside a golden robotic figure. The centerpiece to Nelson’s exhibition is “Pandora’s Child,” a triptych that features a stunning robotic figure, arms akimbo, with a heart in its chest. 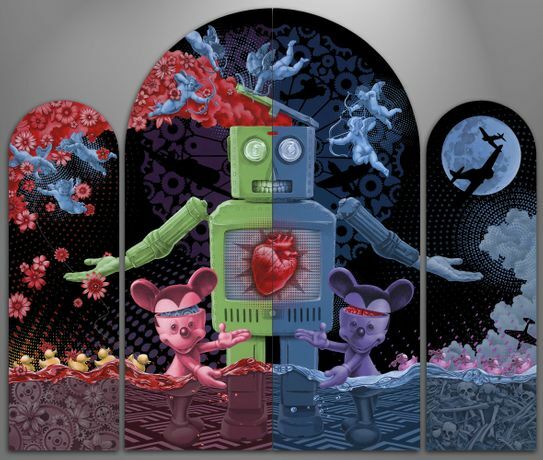 On either side of the figure, two Mickey Mouse images, mouse ears partially lifted to reveal a human brains and mechanical gears inside their heads, pay tribute to the central figure. Above them all, angels, flowers, plummeting planes; at their feet, the water rises, a bed of human skulls beneath the flow. A powerful image that portends both man’s destruction and the approval of Heavenly angels, the work is created in Nelson’s typically brilliant hues, with references to time past as well as the future, a future which may be – now.